In 2010, the Association of College and Research Libraries published a document entitled, The Value of Academic Libraries: A Comprehensive Research Review and Report. This report defined academic library value in the context of overarching higher education institutions, summarized existing literature on library value, recommended “next steps” for libraries seeking to extend and improve their value, and outlined a research agenda for future investigations of library value. Because the report addressed a national academic library audience, it did not provide a single solution for individual libraries seeking to increase their value. Rather, it described a variety of options that libraries may evaluate, select, and adapt to their local contexts and unique needs. Consequently, the task of tailoring general library value concepts to specific libraries initially fell to individual librarians. Now, Academic Library Value: The Impact Starter Kit provides a series of 52 activitiesintended to assist librarians as they conceptualize library value, identify existing library value, and increase library value in the context of their institutional missions. take action to assess, expand, and communicate library value in order to position their library as an increasingly valuable asset to their overarching institution. Used in conjunction with The Value of Academic Libraries: A Comprehensive Research Review and Report, the activities found in Academic Library Value: The Impact Starter Kit offer support and guidance for academic librarians seeking to define the value of their libraries, align library value with stakeholder needs, deploy new strategies to increase and communicate library value, and ensure their library’s position as a key contributor to achieving the mission of their institutions, now and in the future. 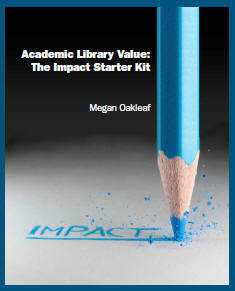 Academic Library Value: The Impact Starter Kit has sold 750 copies worldwide! Until we complete a new printing, the workbook is not available for purchase. If you wish to purchase Academic Library Value: The Impact Starter Kit, please contact Megan directly at (moakleaf@syr.edu). UPDATE: Academic Library Value: The Impact Starter Kit is available via the American Library Association here!